Lithium-ion battery energy storage system for Naka-Tane Substation. Toshiba Corporation today announced that it has delivered battery energy storage systems integrating the company's SCiB, an innovative lithium-ion secondary battery to Kyushu Electric Power Co., Inc., for a demonstration project to expand introduction of renewable energy sources on remote islands. 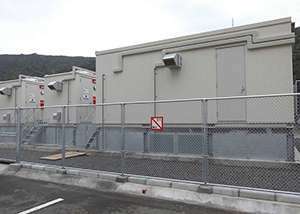 The systems have been installed in substations on Tanegashima Island and Amamioshima Island, in Kagoshima prefecture, and will be used to demonstrate the integration and optimum control of battery energy storage systems deployed to manage frequency regulation and maintain stable power supply on remote islands, which are increasingly turning to renewable energy sources. The demonstration program will run for three years to fiscal 2016. When large-scale renewable energy sources such as wind and photovoltaic are integrated into power grids on remote islands, power frequencies tends to fluctuate due to intermittent power outputs from the renewables. 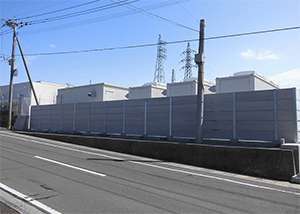 Toshiba's battery energy storage systems provide such islands with an excellent solution for efficient and effective frequency regulation. Lithium-ion battery energy storage system for Tatsugo Substation. The maximum output and capacity of the systems Toshiba has delivered are 3,000kW and 1,161kWh for Tanegashima Island and 2,000kW and 774kWh for Amamioshima Island. Both systems integrate Toshiba's SCiB lithium-ion secondary batteries, which are known for their long-life and excellent performance: support for over 10,000 charge-discharge cycles; rapid charging and discharging; high level reliability and operational safety. Gotta start somewhere. Brave move.